All of us use our arms a lot. You don’t think about it much, but you probably notice it when you injure your shoulder. I did not realize how much difficulty it caused to have a shoulder injury until l hurt my shoulder about 15 years ago. A shoulder injury can make it difficult to do routine activities. You may have problems putting on your shirt or combing your hair. A shoulder injury can make it especially difficult to perform some jobs. Almost anyone who suffers a shoulder injury at work will likely face some difficulty when trying to return to work. This article will focus on returning to work with a shoulder injury and how Georgia’s workers compensation law impacts that. What types of shoulder injuries make it difficult to return to work? Not all shoulder injuries are the same. Some shoulder injuries heal up quickly and do not cause continued difficulty. I was lucky. The shoulder injury I suffered about 15 years ago was just a minor sprain. It healed up within about a month. Other times, shoulder injuries are more serious. One of the most common types of shoulder injuries I see is a rotator cuff tear. This type of injury often requires a surgery to repair the tear. Other shoulder injuries can require surgery as well. Hopefully, your shoulder injury will heal up quickly. But, regardless of what type of shoulder injury you suffer, you may have difficulty returning to work. Why would my shoulder injury cause me to have difficulty doing my job? 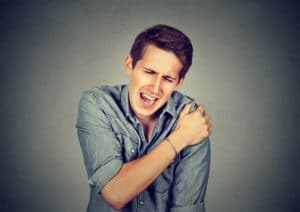 While people performing these types of jobs may find it especially difficult to return to work, a shoulder injury can make it difficult to return to any type of work. 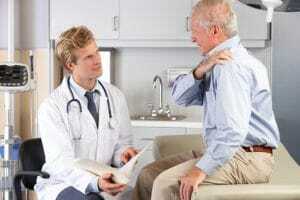 What if my employer offers me a light duty job before I have shoulder surgery? Your employer can offer you a light duty job at any point. They can even offer you a light duty job when the doctor has recommended surgery. The important question is whether the job offered is suitable. 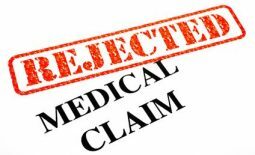 In most circumstances, your treating doctor will make the call on the suitability of the job. For example, your doctor may recommend that you restrict yourself to no lifting over 10 pounds and no overhead work. These restrictions from your doctor usually carry a lot of weight in determining whether a potential job is suitable. Georgia has some special rules that apply to light duty job offers. These rules address payment of benefits and attempts to return to work. If you are dealing with a situation where your employer may offer or has offered to bring you back to work, you need to know these light duty job rules or have someone on your side who does. Just click here to read an article I wrote that discusses those rules in more detail. What happens when I return to work after shoulder surgery? Georgia’s law pretty much treats light duty job offers after surgery the same as job offers before surgery. The important question will be whether the job offered is suitable. Ultimately, the doctor will either place permanent work restrictions on you or release you to full duty. If your employer offers you light duty work, your job may change over time as these restrictions change. Often, your doctor will order a functional capacity evaluation to make a determination about whether you can go back to full duty work or shoulder remain on work restrictions. What happens if I reinjure my shoulder after returning to work? You may end up with an entirely new workers compensation case if you suffer a new injury. 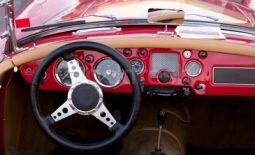 If you think you have suffered another injury or made your original injury worse, you will want to be careful and see how the insurance company treats it. If you suffer a new injury, you need to make sure that it is documented. I would also recommend that you talk to me or another workers compensation attorney to make sure the insurance company handles the new workers compensation claim correctly. What if my shoulder injury prevents me from returning to work? If your shoulder injury prevents you from returning to work, you will probably continue drawing workers compensation temporary total disability benefits. Usually, the insurance company has to pay these benefits to you if your injury prevents you from going back to work. Does my employer have to provide me with a light duty job for my shoulder injury? Pay you weekly workers compensation benefits. This is the basic rule, but there are are some exceptions. But, you generally cannot force your employer to provide you with a light duty job. Under Georgia’s workers compensation rules, your employer can usually choose to pay you benefits instead of providing light duty work. It is important to clarify that I am only talking about Georgia’s workers compensation rules. Some other state or federal laws might require your employer to provide you with work if they are able to accommodate your restrictions. Can my employer fire me if I cannot go back to my regular job? In Georgia, most employees are in an “at will employment” situation. This basically means that your employer can fire you for a good reason, a bad reason, or no reason at all. There is nothing in Georgia’s workers compensation law that prohibits your employer from firing you if you are unable to return to your job. Again, other areas of state and federal law may provide you with some additional protections that prohibit your employer from firing you for certain reasons. One important thing to consider is that being fired does not usually end your entitlement to workers compensation benefits. In other words, your benefits can continue after you are fired. But, the manner in which you are fired will usually determine whether your workers compensation benefits restart automatically or whether you will have to fight in court to try to get them restarted. If you have been fired or are concerned that you may be fired, please take a look at this article that discusses how being fired affects your workers compensation case.